Although Walt Disney World is known for huge crowds at the theme parks, there are many quiet spots where very few guests typically visit. 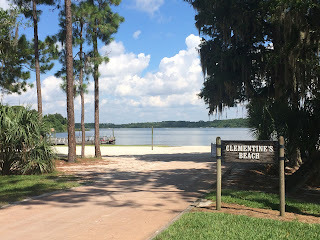 One such place is Clementine's Beach at Fort Wilderness. This quaint little beach sits on the shore of Bay Lake and is not far from the boat dock. It is rare that I see more than a handful of people utilizing this sandy paradise.